Ubuntu is a Linux distribution that is quite popular right now, which is designed as an operating system for the end user. Ubuntu is designed for users in general, different from the past where most Linux distros are designed with a difficult administrative procedures. Ubuntu has improved its ability to handle tasks automatically so easily used by ordinary users. 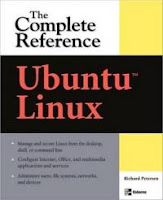 The Complete Reference Ubuntu Linux Book covers the desktops, shells, and administration tools for users, printers, services, and networks. Get full details on the latest Ubuntu-compatible office, mail, Web, and multimedia software, along with remote access (Vinagre), virtualization (KVM and Xen) and service managment (Upstart).You'll also learn how to interoperate with Windows networks and deploy reliable security using PolicyKit, Seahorse, AppArmor, SELinux, netfilter, and the Secure Shell.